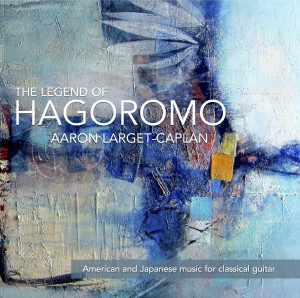 The Legend of Hagoromo, an epic 18 minute singe movement work by Japanese composer Keigo Fujii (b.1956) is dedicated to David Russel with whom the composer studied guitar. You can find a write up about this work in an article on Aaron Larget-Caplan’s site. It’s a beautiful opening to the album with lush orchestral chords and pacing that ranges from improvisatory to determined forward moving momentum. Excellent musical playing by Larget-Caplan, and believe me, his playing is put to the test with a wide variety of textures and challenges in terms of balance and the large scope of the piece. You get orchestral brushing, sweet melodic lines, a little Spanish touch here and there, Japanese modes, tremolo, harmonics, everything. It meanders a bit but always brings you back with bouts of focused writing. Based on a folk tale, the composer used a 16-bar song by Hiroshi Yamanoha (d. 1991), on the same title, as a basis for the work which helps tie it all together. Takemitsu was an obvious choice for the album and Equinox delivers the goods. Also, perfectly in line with the album’s concept, Takemitsu’s arrangements of Gershwin and Arlen connect the two countries even if the music itself seems a bit out of place. General listeners will find it interesting to hear the two sides of Takemitsu ranging from contemplative dissonance to jazzy arrangements of American music. The inclusion of Takemitsu also allows some bending of the rules to get Cuban composer Leo Brouwer’s Hika, in memoriam Toru Takemitsu onto the album. Larget-Caplan’s Brouwer delivers a focused performance with nice spaciousness where needed. Personally, I was most interested to hear the new music on the album. On the American side we have a premiere by Ken Ueno (b.1970). Ed è subito sera is an exhilarating and hypnotic work combining some of the best textures the guitar can produce but not in a cliché way. The quick tremolo/arpeggio effect with the surrounding twinkling notes and micotones (bends) are very effective. Too bad this wasn’t a multi-movement work as it’s very successful and well played by Larget-Caplan with a driving determination. My only wish was that the composer would have extended the dissipation at the end to lasted longer. Japanese-born composer Kota Nakamura’s Sui-hou is a slow but steady meditative expanse. I like how the work pulls the listener into single notes while exploring multiple textures around it. 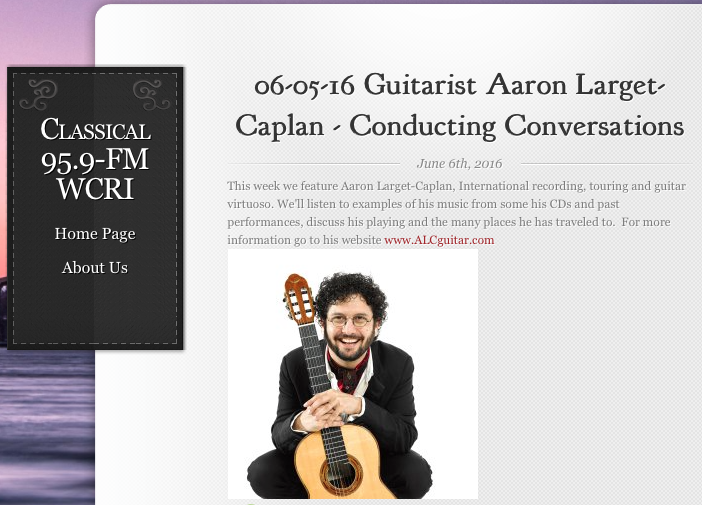 The melodic strumming is very successful and handled tastefully by Larget-Caplan. Both works were commissioned for Aaron’s New Lullaby Project The Martin Max Schreiner arrangements of Two Japanese Idylls offer a mirror of the Takemitsu arrangements. These pretty, melodic, swaying works are a beautiful way to cool-down for the end of the album. Plenty of interesting effects reminiscent of traditional Japanese music and instruments: angular strong-weak melodic lines, bends, repetitive alternation, and percussion. Overall good recording quality, more of a studio sound rather than live. It sounds a bit on the close-mic side with some overpowering mid-range to bass but nothing unpleasing. It does offer a wide spectrum of warm bass sounds to brighter and plucky tones. I think the opening chords of Fujii’s work is well suited to the mix with a warm, almost watery-bell-like sound emerging and the harmonics are nice and soft rather than piercing or too glassy. Maybe Equinox could have benefitted from a different mix but I’m splitting hairs. Also, because of the wide range of textures this mix ensures that the strumming and other effects are not harsh which was the right choice. A great review of Aaron’s arrangement of ‘Six Melodies by John Cage for violin and guitar in This is Classical Guitar by Bradford Werner. 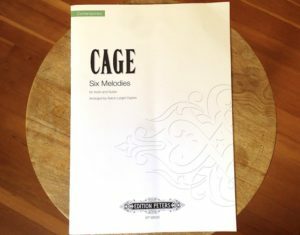 ’s such a treat to be able to play the music of John Cage from this era of his compositions. The gamut technique and the nested rhythmic proportions are the same used in his String Quartet in Four Part… theory aside, they create a tranquil and almost hypnotic motivic puzzle of beauty. There is little music of this style and era specifically written for guitar so high quality arrangements are very welcome.